The senseless mass shooting in Las Vegas on the night of October 1st. which occurred when Stephen Paddock rained gunfire down on concertgoers was the worst catastrophe of its kind ever, in the U.S.. A look at our country's chart indeed, sure spells it all out. I use the chart for the signing of the Articles of Confederation, as suggested by deceased astrologer David Solte. I did a triple chart, with the inside the relocated U.S. chart for Washington, D.C. . The inside chart is the progressed chart, and the outside chart is the converted Las Vegas time to Washington. I dated it for Oct.2nd, since it was after midnight then in Washington. I thought that by keeping all the info in one place would make it less confusing to follow. The numbers also tie into the event which is amazing in itself! For example, progressed Mars at 9 degrees of Aries T-squared the transiting Sun at 9 degrees of Libra which conjoined the 8th house cusp and opposed the 2nd cusp at that number. Mars rules the sign of Aries, and Stephen Paddock was not only an Aries, but his birthday was on April 9th, 1953, which again, ties the number 9 into this very deadly aspect and event! Other unbelievable aspects that are involved and triggered this event are progressed U.S. Uranus squaring transiting Mars. The progressed U.S. part of fortune conjoins the natal U.S.Uranus and goes on to square transiting Venus. Transiting Jupiter T squares natal U.S. Pluto and transiting Uranus. The progressed U.S. Sun conjoins the 6th house cusp which, of course, opposes the 12 house cusp. Transiting Neptune T squares the progressed U.S.nodes. And the transiting Moon then opposed natal U.S. Jupiter. The second chart below is for the progressed U.S. chart. The ascendant has moved into Scorpio, which T-squares the progressed Pluto and the 7th house cusp. This would explain the excess amount of hatred,which abounds these days, especially in the political (Uranus) area. It also ties into Hillary Clinton, an early Scorpio who was defeated in the election, and continues to make statements which at times, embarrasses her party!. And finally the number of 0 coverts to 60..That is, you convert all the numbers in a chart into ages, and when you come to the number 30, you add another 30 to it, which adds up to 60; the number of people who were massacred (including the shooter) that night! 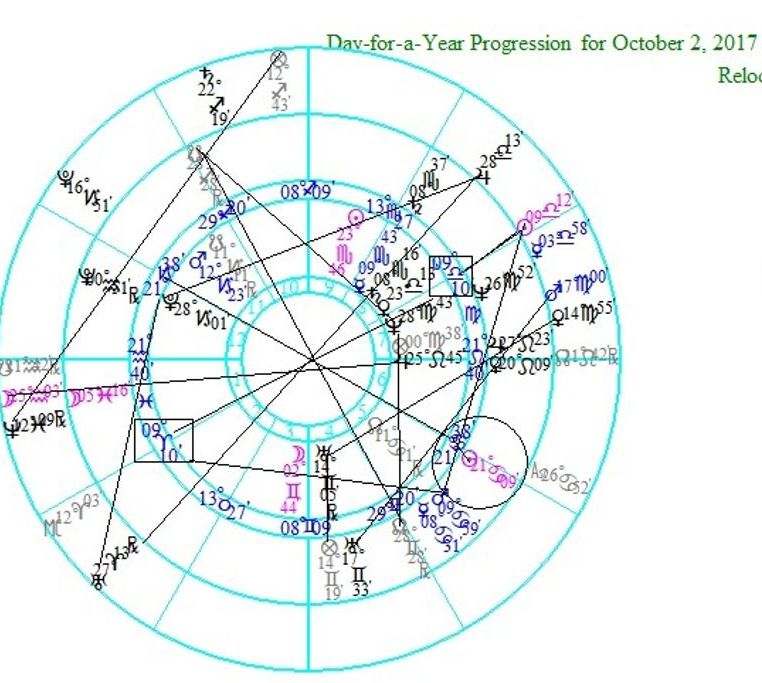 One other observation, someone who posted Paddock's chart on line listed his Jupiter at 23 Taurus. This opposes the U.S. Sun of this chart at 23 Scorpio. 23 also ties into the fact that 23 weapons were found at the crime scene. With all of these tight connections, I don't know how anyone could believe that this chart is not the authentic U.S. chart!